AMOSSHE Executive Member Pete Quinn, who was previously Director of Student Support at University of York, was elected to the Executive role in July 2016 for one year because Fay Sherrington changed her role to become AMOSSHE Vice Chair. Pete is now pursuing consultancy work, so the role becomes available for a representative of an AMOSSHE member organisation. The entire AMOSSHE team extends their thanks to Pete for his work with AMOSSHE during this academic year, and wish him well for his future in the higher education sector. The AMOSSHE Executive Committee has consulted the list of candidates who members voted for in June 2016, to find the unelected person with the most votes to take Pete’s place as Executive Member for the remainder of the 2016/17 academic year. AMOSSHE is delighted to welcome Jill Stevenson, Head of Student Support Service at University of Stirling, as the new Executive Member. As Head of Student Support Services at the University of Stirling, I am privileged to have the opportunity to make transformational changes that make tangible differences to the lives of our students. I would be delighted to extend this impact across the sector as a member of the AMOSSHE Executive. I believe that I can contribute a unique combination of energy, drive, and a fresh perspective, coupled with an extensive knowledge and understanding of the student support and equality and diversity agendas. I recently led a significant restructure of Student Support Services at Stirling, resulting in the creation of an increasingly integrated, resilient and student-focused service. At the heart of this initiative is a desire to optimise the student experience through the provision of adaptable, accessible and well-promoted services, delivered by a customer-focused team of the highest calibre. I am deeply committed to creating a shared culture of accessibility, inclusion and respect for diversity. I consider the development of strong partnerships – internally and externally within and outwith the higher education sector – as pivotal to this ambition. This vision, coupled with the ever-increasing demand for all our services, requires universities to share knowledge, expertise and resources to develop impactful and innovative initiatives that not only enable students to achieve their potential at university, but also equip them with the resilience and life skills to become confident and employable graduates. As a member of the AMOSSHE Executive, I would seek to foster effective collaborations, and create a sound evidence base that convincingly demonstrates the impact of Student Services to policy-makers and funders. I’m excited to have the opportunity to collaborate with and represent my sectoral colleagues in pursuit of our shared ambitions to enhance the lives of our students. 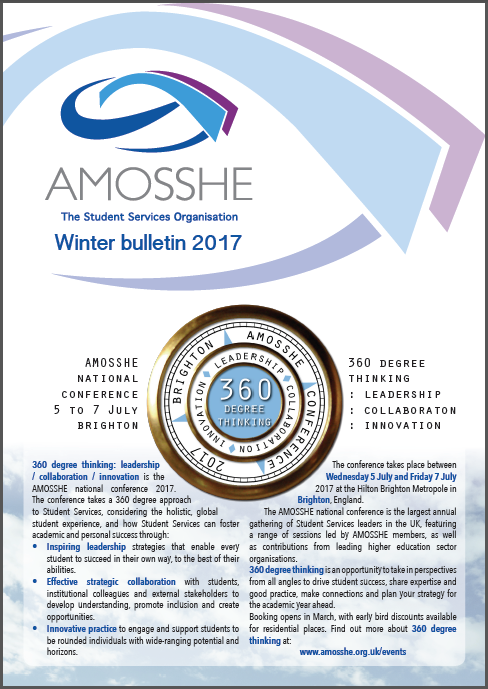 Here's the AMOSSHE quarterly bulletin for winter 2017: a roundup of AMOSSHE news, events, and more (click image to view - PDF 5.6 MB). In this bulletin find out about the AMOSSHE national conference 360 degree thinking, which takes place in July. There’s also news about a host of other AMOSSHE events coming up in the spring. Find out about the Student Services projects AMOSSHE is funding this year through AMOSSHE Insight, and catch up on the outcomes of our most recent continuing professional development event, which discussed how Student Services can tackle gender-based violence in higher education. AMOSSHE is holding a continuing professional development event about how Student Services can more effectively support trans students in higher education: Supporting trans students. Focussing attention on support for trans students has never been more timely. Recently the London Assembly Health Committee published a report on the mental health needs of LGBT+ people, which finds that while these people are more likely to experience mental ill health than the wider population, LGBT+ people are often overlooked in needs assessments and consequently in mental health commissioning decisions. Meanwhile in Texas, USA, legislators have introduced a bill to senate that would restrict trans-identified people from utilising restrooms and changing facilities that align with their gender identity. This applies to public colleges and universities. State-led actions such as this contribute to the sense of a hostile culture for trans students around the world, impacting their mental wellbeing. Supporting trans students is an opportunity to review updated guidance from the Equality Challenge Unit for staff in higher education institutions across the UK and colleges in Scotland about improving experiences for trans students and staff. The event also explores in a practical way how Student Services can enable trans students to realise their academic potential. Supporting trans students takes place on 23 March 2017 in Birmingham. Book your place now! AMOSSHE, The Student Services Organisation, is looking for contributors to lead sessions at our national conference 2017 - 360 degree thinking: leadership / collaboration / innovation. The conference takes a 360 degree approach to Student Services, taking in perspectives from all angles to drive student success – encompassing inspiring leadership, effective collaboration and innovative practice. The conference takes place between Wednesday 5 July and Friday 7 July 2017 in Brighton, UK. Find out all about the conference theme and call for proposals, and submit your session proposal, here: National conference 2017: call for session proposals. Please submit your session proposals by 17:00 on Wednesday 15 February 2017. Forging an engaging academic community, and building effective relationships with colleagues, students, and external stakeholders, are key aspects of the work of Student Services. To help Student Services leaders and practitioners engage with these communities, AMOSSHE is hosting a conference to explore how we can work with institutional colleagues and stakeholders to create effective relationships, and how we can create engaging communities for our students that enhance their learning experience and promote retention and success. Engaging Communities, the AMOSSHE winter conference 2017, takes place on 17 February in Manchester, featuring a range of AMOSSHE member-led sessions showcasing innovative practice and strategy, as well as inspiring keynote presentations from key voices in the sector. Our first confirmed keynote is Sara Fernandez (Executive Director, Student Hubs). Student Hubs supports students to tackle social challenges, learn about issues and connect with each other. Their work includes supporting student leaders in UK universities to learn, connect and do something to tackle social issues, through volunteering, skilled placements, project incubation and critical engagement events. Find out more and book your place here: Engaging communities. 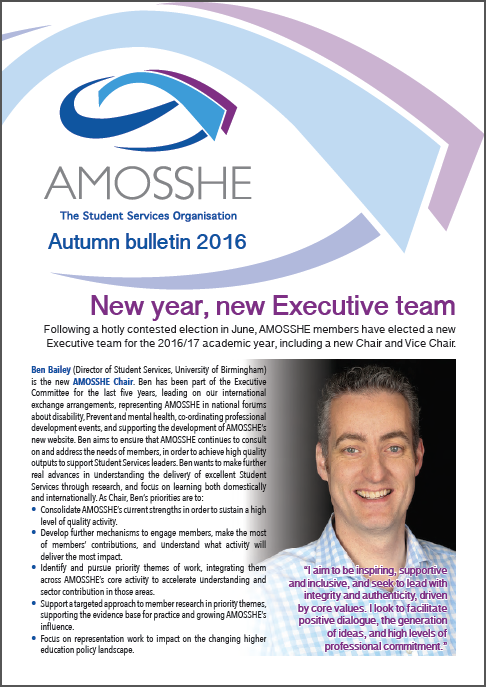 Here's the AMOSSHE quarterly bulletin for autumn 2016: a roundup of AMOSSHE news, events, and more (click image to view - PDF 4.5 MB). This bulletin introduces AMOSSHE's newly elected Chair Ben Bailey, and Vice Chair Fay Sherrington, as well as the Executive Members who were also elected in July this year. There’s also an overview of what AMOSSHE has planned for the 2016/17 academic year, as well as highlights of our upcoming continuing professional development events. Today Universities UK published recommendations for higher education providers to help implement approaches to address violence against women, harassment and hate crime affecting students. AMOSSHE, The Student Services Organisation, was part of the taskforce set up to examine these issues, and contributed a Student Services perspective to the recommendations. “AMOSSHE welcomes Universities UK’s recommendations, because the difficult and sensitive issues they deal with continue to be recognised and addressed across the higher education sector. Student Services are often at the front line in tackling incidents of violence, harassment and hate crime, and a joined-up approach within institutions and a collective effort by the sector as a whole is essential for creating an environment where these challenges can be tackled effectively, and eliminated as far as possible. Students feeling safe supports them to achieve their academic potential, and implementing these recommendations will help create the positive, secure educational experiences that so many students already enjoy, but all deserve. In response to the publication, AMOSSHE is hosting an event to explore the recommendations in a Student Services context. The event explores how to implement the recommendations through Student Services strategy and practice, while sharing good practice and ideas. Find out more about the event here: Tackling gender-based violence. Here are the Universities UK recommendations: Taskforce publishes recommendations to universities on dealing with violence against women and harassment. On 22 September 2016 HEPI (Higher Education Policy Institute) published a report called ‘The invisible problem? Improving students’ mental health’. The report highlights the growing demand for mental health services within universities, and discusses underfunding of counselling services both within universities and within the NHS. You can access the HEPI report here: Many universities need to triple their spending on mental health support: urgent call for action in new HEPI paper. AMOSSHE is pleased that this report raises the profile of the issues that our members have been dealing with for a number of years. Recent member feedback carried out by AMOSSHE showed that 80% of contributors believed there was a noticeable increase in complex mental health crises amongst their student population from 2014 to 2015. It is very pleasing to see that the report recognises the challenges that students face in accessing mental health services due to the lack of continuity of care between home and university. It is important to recognise that most universities in the UK provide a range of wellbeing and mental health services that may work alongside, be integrated with, or be separate from counselling services. A ratio of students to counsellors is not necessarily a reliable way to determine the level of staffing support that is provided to students within our diverse universities. Funding is a crucial element for supporting students with mental health needs, and AMOSSHE supports the notion that universities should continue to increase funding in mental health and counselling services where appropriate, alongside other supportive wellbeing services. AMOSSHE supports over 160 higher education providers across the country with over 600 members. Over 95% of our members have reported through our surveys that they have mental health services under their remit. 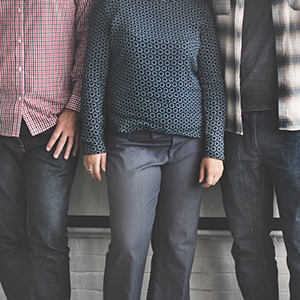 Our members are primarily directors of student support services and heads of support areas such as mental health, counselling and wellbeing services. For further information please contact the AMOSSHE National Office. You can find details of AMOSSHE's member survey about student mental health here: AMOSSHE members feed back about student mental health and suicide. 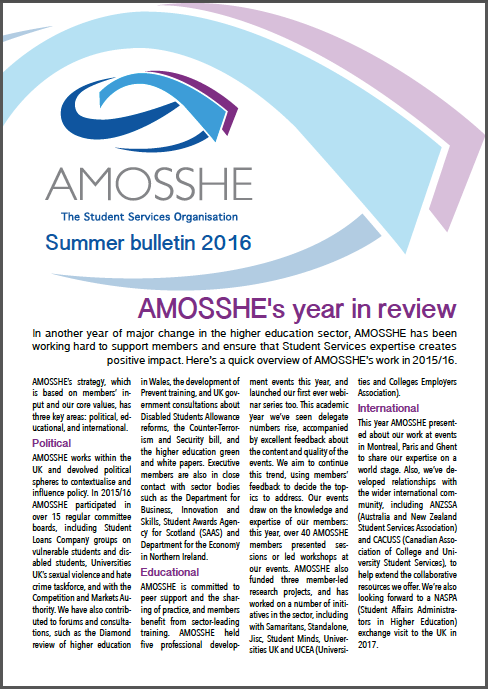 Here's the AMOSSHE quarterly bulletin for summer 2016: a roundup of AMOSSHE news, events, and more (click image to view - PDF 4.4 MB). This bulletin contains an overview of AMOSSHE's work this year, plus summaries from our Executive team about their activity in the sector and on behalf of members. There's also a roundup of our national conference, Breaking Boundaries, and details about AMOSSHE membership and events for the academic year ahead. In 2016 six roles became available on the AMOSSHE Executive Committee, to serve for a period of two years from 1 September 2016 to 31 August 2018. 15 AMOSSHE members nominated for these roles, and the new Chair and Executive Member roles were decided by a membership ballot. There was no competition for the available Vice Chair role, so this appointment didn't require a membership vote. At the 2016 AMOSSHE annual general meeting in Glasgow on 6 July, Nicole Redman (Vice Chair Operations) announced the names of the people who were elected. The new committee members will take up their roles from 1 September 2016. Here are the people who join the AMOSSHE Executive Committee for the 2016-18 term of office. Ben Bailey (Director of Student Services at the University of Birmingham) takes the role of AMOSSHE Chair. Fay Sherrington (Director of Student Services at Edge Hill University) takes the role of AMOSSHE Vice Chair. Nicola Barden (Director of Student Services, University of Winchester). Mandi Barron (Head of Student Services, Bournemouth University). Helen McNeely (Head of Student Affairs, Queen's University Belfast). Chris Shelley (Director of Student Services, King's College London). In addition, because Ben Bailey is taking the Chair role, his Executive Member role becomes vacant for one year. So Peter Quinn (Director of Student Support, University of York) takes this place for one year. Many thanks to Ben Lewis (Director, Student Support & Wellbeing Division, Cardiff University), Brian Hipkin, and Maria Lorenzini (Director of Student Experience, Bangor University), who leave the Executive Committee at the end of August. I have been an institutional lead member of AMOSSHE for 13 years, and contributed to the Executive Committee for the last five years. Recently serving AMOSSHE on the Executive, I have made my contribution in a range of areas of work. I have led on our exchange arrangements with NASPA (Student Affairs Administrators in Higher Education), supported the National Office with the membership survey, represented us in national forums relating to disability, Prevent and mental health with the Department for Business, Innovation and Skills, HEFCE (Higher Education Funding Council for England), Student Loans Company and Universities UK. I have also co-ordinated a continuing professional development event and am currently involved in supporting the development of a new website for the association. My contributions continue to be motivated by my belief that AMOSSHE is a key part of supporting colleagues in Student Services. Supporting them to deliver important outcomes for students and also therefore, our institutions. Whether about national policy, professional development or sharing and advancing best practice and ideas, AMOSSHE’s work and member networks can be invaluable. We achieve high quality outputs to support members. We make further real advances in understanding of the delivery of excellent Student Services through research. Our focus is on learning both domestically and internationally. I am passionate about seeking to continue to support AMOSSHE’s work and feel ready to do this as Chair, and would be grateful for your support in being able to do that. AMOSSHE continues to go from strength to strength. Our membership has grown; profile has increased; activity, reach and influence have grown; and National Office team is strong. Consolidate on the progress made, ensuring we can sustain this level of high quality activity. Develop further mechanisms to engage members, make the most of your contributions and understand what activity will deliver the most impact. Identify and pursue priority themes of work, integrating them across our core activity to accelerate our understanding and sector contribution in those areas. Support a targeted approach to member research in our priority themes, supporting the evidence base for practice and growing our influence. Focus on our representation work to impact on the changing higher education policy landscape. Having developed my leadership in Student Services with the support of the AMOSSHE family I believe I now have the skills and experience to make a contribution as Chair. I aim to adopt a style that is inspiring, supportive and inclusive and seek to lead with integrity and authenticity, driven by core values. I look to facilitate positive dialogue, the generation of ideas and high levels of professional commitment. I am currently the Director of Student Services at Edge Hill University, and having worked in Student Services for 10 years at three very different higher education providers, I have developed a range of skills and experience across a number of specialist areas. I feel that I continue to have a lot to offer to the Executive and would love the opportunity to do a further term, this time in a Vice Chair role. Being an Executive member of AMOSSHE has provided me with new experiences and skills that have been invaluable in my roles both past and present, and in my career development. I have given a great deal of time and enthusiasm to AMOSSHE and feel I have been able to contribute to the development of our sector. I am very keen to build on the progress made by the current Executive and National Office teams and to seize the opportunity to play a more significant role in the future of AMOSSHE as a Vice Chair. For me, the biggest contribution I was able to make to AMOSSHE over my time on the Executive was to co-lead the organisation of the annual conferences in Manchester (2014) and Newcastle (2015). I have also represented AMOSSHE on a number of boards and meetings, chaired Futures events, led continuing professional development (CPD) events and organised many regional meetings. I was very pleased to lead the organisation of the leadership CPD event this year. The AMOSSHE survey results from 2015 showed that ‘management and leadership’ was one of the top three topics that members wanted to see in future CPD events. I was committed to ensuring that this new event was unique and that there was a focus on Student Services to make it relevant and also of high quality. My previous four years’ experience of serving on the Executive puts me in a good position to provide consistency and bring existing knowledge to the Vice Chair role. My priorities in the role are underpinned by AMOSSHE’s values and strategy and shaped by the role and tasks of the Vice Chair. Working alongside the Chair, Vice Chairs and wider Executive I would prioritise taking forward projects that can deliver benefit to the whole membership. Specifically, priorities would include developing new and appropriate income streams that can be put forward for approval by the ethics board. Equally important is the ongoing work to enhance membership communication and engagement through improvements to the website. My leadership style is one of influencing, persuading, gaining consensus and working collaboratively. As a volunteer member of the Executive surrounded by senior colleagues and working with outside organisations, I have found this style to be hugely beneficial. I have built up a good working relationship with the staff in the National Office and my colleagues on the Executive, and believe I have the qualities to be a strong Vice Chair. I have been a member of AMOSSHE for many years, currently as Director of Student Services at Winchester University, and initially when managing Counselling and Mental Health Services at the University of Portsmouth. I have attended AMOSSHE conferences and regional meetings, and in 2013 completed one of the first Insight projects, ‘Mental Health Risk Assessment Across Services: Good practice and pitfalls’. I have experience of committee work through BACP (British Association for Counselling and Psychotherapy), as Chair of the Association and of various committees within it. Part of the role was to listen to and represent the views of members and to link those with a strategic direction that met the overall goals of the organisation, which is experience I would bring to the role of being on the AMOSSHE Executive. I have clear interest in mental health issues, and am a member of the Mental Wellbeing in Higher Education Working Group (MWBHE), which provides consultation, runs conferences for the sector, and in 2015 published, with Universities UK, the Student Mental Wellbeing in Higher Education Good Practice Guide. I represent MWBHE / Universities UK on the newly formed Advisory Board for the National Union of Students Alcohol Impact Initiative. I would hope to contribute this to the Executive as an area of special interest. Winchester is a new university with a traditionally shaped Student Services department. Its smaller size (circa 8,000 students) means I am involved with a wide range of activities on a number of levels, from delivering the access agreement to managing the choirs that sing at graduation. I have been heavily involved in preparing for the changes to the Disabled Students’ Allowance and with other issues of equality and diversity. This variety is part of the pleasure of working in Student Services and is also part of the broader picture that would inform my ability to contribute to AMOSSHE if elected. I was elected as a member of the AMOSSHE Executive in 2014 and have enjoyed the experience so much that I have decided to stand again. During my term of office I have been involved, with my fellow Executive members, in reviewing the AMOSSHE strategy and establishing an ethics committee to help with future partnerships. I was a shadow member of the planning team for the All Change conference in 2015. I have taken the opportunity to promote AMOSSHE beyond our normal Student Services boundaries by presenting at conferences run by USHA (the University Safety and Health Association) and CNOUS / Deutsches Studentenwerk (our French and German counterpart organisations) as well as our more traditional partners such as Access to Education. I have also represented AMOSSHE on the Prevent Reference Group, working with the Department for Business, Innovation and Skills, HEFCE (Higher Education Funding Council for England), Universities UK and LFHE (Leadership Foundation for Higher Education) to develop the LFHE Prevent training package, and chaired the AMOSSHE round table session on duty of care. If re-elected I will continue to raise the profile of AMOSSHE through local, regional and national collaborations. I am committed to the advancement of Student Services in higher education and believe that we do need to approach things differently to keep abreast of the changing challenges that our students and institutes are facing. I have a particular interest in how we support non-specialist staff to deal with challenging student issues. I believe my experience on the AMOSSHE Executive over the last two years, coupled with my institutional experience of all aspects of student life, has offered me excellent insight into the skills and attributes required for the role of an AMOSSHE Executive Member, and I would consider it a privilege if I were to be elected for a second term. Having just completed a two year term of office on the AMOSSHE Executive I would love the opportunity to continue for another two years to see through some of the work I have had the chance to be part of on behalf of the organisation. As a Head of Service at a regional university, I understand the importance and value of our connectedness as a body. I hope I have been able to support greater connectedness and sharing of good practice through my work helping to organise this year’s Winter Conference on duty of care, an issue of mutual concern to a large number of us. I also have the privilege of being part of the National Conference organising team for the summer conference 2016, helping us think through how to break boundaries in supporting students. If the membership re-elected me I would be interested in assisting with future continuing professional development events, the benefits of which are across our whole membership. My current portfolio at Queen’s includes not only traditional Student Support Services but also Academic Affairs – the merging of these two functions has allowed my teams to work closely together with our academic colleagues to promote student wellbeing at every stage of the curriculum. I see this is an growing theme in the work of Student Support Services and would like to see what we can do as an organisation to explore this more fully. Finally, in an increasingly diverse and regionally devolved sector I think it is important for voices from every area of the UK sector to have an active role in AMOSSHE. Hopefully returning to the Executive would allow me to continue to feed in to the national conversation from a regional perspective. I’ve been at the University of York three years in June and am now interested in becoming more involved with AMOSSHE as an Executive Member. At York I have responsibility for a wide variety of Student Support areas and, like many of us, am experiencing institutional changes, re-structures and other significant challenges. I am continuing to learn from these experiences and have always enjoyed sharing these and learning from others in a really collaborative way. I believe my recent and previous experience would be an asset to AMOSSHE. I take my work very seriously; myself less seriously and with a balance of effort, energy and enthusiasm I would be pleased to have the opportunity to help contribute to the progress AMOSSHE has made to date. AMOSSHE undoubtedly has a role to play in the constantly evolving development of Student Services. I believe we can continue to provide networking, advice and continuing professional development opportunities that enable all of us to benefit from our collective experience in terms of local, regional and national challenges. I have previously been a board member of NADP (National Association of Disability Practitioners) for several years and made a positive, collaborative and dynamic contribution there. I've also been Chair of a charity (KEEN) whilst at the University of Oxford and can bring this experience to the AMOSSHE board, benefiting the membership as a whole. I still contribute financially to a school I taught at in Tanzania in the 90s and have been maintaining consultancy links with the Hong Kong Institute of Education over the last few years focussing on disability support structures. My family occupies most of my free time but when not spending time doing Dad stuff, listening to Greg Proops or playing ‘Words with Friends’ I can be found taking part in York Park Run, reading or enjoying Dim Sum. When I took on the role of Director of Student Services at King’s, one of my first actions was to join AMOSSHE and extend the number of named members at King’s too. I am a great believer in the power of a national body that brings us together and maximises our collective knowledge, experience and ideas to help us become more than the sum of our parts. While we toil away at our respective institutions the power of AMOSSHE is always behind us, and for that reason I am keen to play my part in helping it continue to grow and strengthen. I believe I have much to offer in both energy and experience. Since I took on my role the remit has more than doubled in size, now incorporating Academic Services such as timetabling, exams, graduation ceremonies, conduct and appeals, and visa compliance, alongside the ‘traditional’ welfare services. Like you, I have dealt with major institutional crises and individual emergencies as well as the daily challenges of developing services to meet increasing demand. As Prevent Lead at an institution in the spotlight I have more experience than I would like in handling the pressures that the duty has brought to us all, and I produced one of the modules for the Leadership Foundation for Higher Education’s suite of materials as a result. I previously worked at the National Union of Students, supporting Students’ Unions across the UK and developing their processes around member engagement, elections, charity governance and campaigning. This gives me a broad knowledge of the sector and the challenges faced by institutions large and small, and I would like to bring this perspective to the AMOSSHE Executive. I am excited by the opportunity to contribute to AMOSSHE as an Executive Member and I hope you will give me your support to do so.